As a top plastic surgeon in NYC, Dr. Weintraub’s philosophy is less is more. “Results should be conservative and understated with a keen eye toward natural beauty,” he explains. 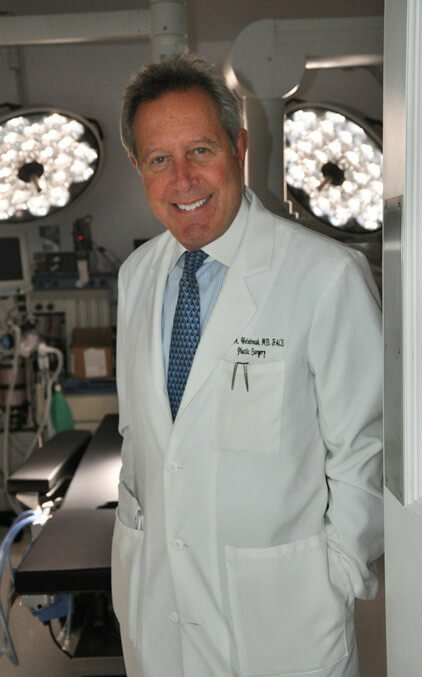 He practices in New York City and East Hampton and specializes in high quality, detailed cosmetic plastic surgery of the face and body, employing cutting-edge approaches to treatments. Dr. Weintraub uses the latest minimally invasive, non-surgical and short-incision techniques to provide the maximum benefit to his patients. For example, Dr. Weintraub performs facial plastic surgery by gently suspending tissues and restoring the lost volume of youth with fat transplantation, rather than using unnaturally tight skin traction. In plastic surgery of the nose, Dr. Weintraub employs the newest techniques in structural manipulation of cartilage that produce beautifully graceful contours and natural profiles. In post pregnancy tummy tucks, he uses tedious corset placation to create the natural beauty and small waist of a youthful abdomen. As a meticulous New York plastic surgeon with Ivy League credentials, Dr. Weintraub is often consulted on difficult cases since his skill set and expertise make him comfortable with every level of challenge. Dr. Weintraub and his staff offer you a warm welcome and invite you to discuss your concerns in a comfortable and educational environment. Harbor General Medical Center – U.C.L.A. Focusing on high quality, natural and understated cosmetic surgery of the face, eyes, nose, breast, abdomen, and body sculpture, as well as all aspects of perioperative plastic-surgical care. I had a rhinoplasty with Dr. Weintraub and am very, very happy with my new nose! He took a lot of time with me during my consultation and answered all my questions and showed me many before and after pictures. I liked that his patients all had noses that were appropriate to their faces, not like he only knew how to make one kind of nose. I also spoke to one of his previous patients who said he did a secondary rhinoplasty on her, which apparently is more difficult than doing a primary rhinoplasty. She is very happy with his work and so am I. I now look good from every angle! He also did many followup visits with me, and taking off the splint and then the tape he did with absolute gentleness, and he did many more followup visits to ensure that I was healing well. I recommend his skill and personable bedside manner and his medical professionalism to everyone. Thanks to Dr. Weintraub for fixing bad results from two procedures I had in Europe and UAE with surgeons who said they specialized in plastic surgery but nearly ruined my face, leaving me thinking there wasn’t any solution until I found Dr. Weintraub on the internet. I sent photos and spoke to Dr. Weintraub who is as nice as he is talented! He was super compassionate and suggested certain surgical techniques to correct the surgery I had before, and I was confident I had found the right doctor to improve things! I travelled to New York in March and had surgery two days later, with all my appointments made for me by Dr. Weintraub’s staff who are very helpful, scheduling my appointments around a parade on Fifth Avenue so I didn’t get stuck in the traffic. Dr. Weintraub came to visit every day at my hotel across the street and called and emailed after I returned home to make sure I have healed well. I am absolutely thrilled and super satisfied with my experience. They were so instrumental making it all happen seamlessly and successfully, so from the bottom of my heart, I thank him sincerely. It seems to me, that in discussing Dr. Weintraub, we are necessarily discussing surgical genius or at least the work of one such virtuoso. He is equipped with a kind of dual aesthetic judgment and technical ability, which is to say, that the good doctor is able to keenly observe and correct minute details while accounting for the overall aesthetic presentation and never sacrificing one for the other. He’s not only a keenly skilled technician but also a more generally talented artist. While most surgeons fall victim to perceiving in a very mechanistic way, causing a loss of resolution in the overall work, Dr. Weintraub seems to work in greater detail but with a conscious fluidity that allows him to execute what he, in agreement with his patients, find aesthetically pleasing. As an artist myself with a recognized career in music, I imagined that I would be among the more difficult of the surgeon’s clients. Having studied visual art and being a recognizable image of peoples’ expectations (i.e., when fans see me), I knew immediately that the work to be done would be under great scrutiny and would require great subtlety. Despite all of my reservations, I knew if any surgeons would find themselves able, it would take someone as masterful as Dr. Weintraub to pull it off. Today, no one has remotely noticed that I have undergone surgical rhinoplasty. Instead, people continue to stop and stare as they had before and those closest to me admire the symmetry, lines, and angles of my face. We all fall subject to our own vanity, it’s undeniable not to acknowledge that appearances give us an edge in today’s highly competitive world. Dr. Weintraub’s work is a brilliant paradox in that it documents a phenomenal improvement but in wildly subtle manner. If this is a medical emergency please call 911. To send a non-urgent message please type your message to Barry M. Weintraub MD, FACS.